Mother Jones had a very busy week on both sides of the Atlantic! Buoyed by your festival in Cork, her spirit sprinted over to aptly-named Jonesborough, Tennessee, to a reunion of 60 women miners and supporters on Aug. 2-4. Women miners traveled from across the United States, England and Canada to east Tennessee for their first gathering in 14 years—and celebrated their rebirth as the “Daughters of Mother Jones.” The women miners, mostly retired, renewed strong bonds and the commitment to organize in the labor movement in the tradition of Mother Jones. They held a special memorial to women miners who have died, including nine killed on the job. The group held broad discussions of organizing more broadly and the need to preserve their history in the USA, held in the large archive of the Coal Employment Project at East Tennessee State University. Women miners were active for 20 years in CEP, their national support, education, and advocacy group as well as being very active members of the United Mine Workers of America. CEP held national conferences for 20 years from which drew hundreds of activists, union officials and union brothers along with women coal miners. This year is the first time women miners have reunited since CEP closed its doors in 1999. They brought memorabilia of their mining years—suitcases full of political t-shirts, photographs, audiotapes, media clips and personal archives. Jody Hogge, a local UMWA president from Illinois, dressed as Mother Jones and gave a fiery update on the union’s fight against coal giants Peabody and Arch Coal to preserve retiree health benefits and pensions for 23,000 families l, which sold off their “legacy obligations” to a company that is in bankruptcy. Many coal areas and states were represented: Alberta, Canada; and Arizona’s Navajo Nation, Illinois, Pennsylvania, West Virginia, Kentucky, Alabama, Ohio, and Tennessee, , along with participants from Georgia and North Carolina. Special guests included CEP friends Anne Scargill and Betty Cook from the Women Against Pit Closures in Barnesley, England, which has fought for justice alongside the National Union of Mineworkers (NUM) since the mid-1980s. Other special guests included nine members of the family of Patsy Fraley, a woman miner from eastern Kentucky who traveled from three states to honor her memory. On Saturday night musician and social activist Sue Massek performed a new play by Si Kahn, “Precious Memories” based on the life and music of Sarah Ogan Gunning, a miner’s wife in eastern Kentucky in the 1930s. Gunning wrote songs about union organizing and miner’s struggles that were deeply admired by folksinger and fellow activist Woodie Guthrie. Women sang along and clapped to the familiar songs. 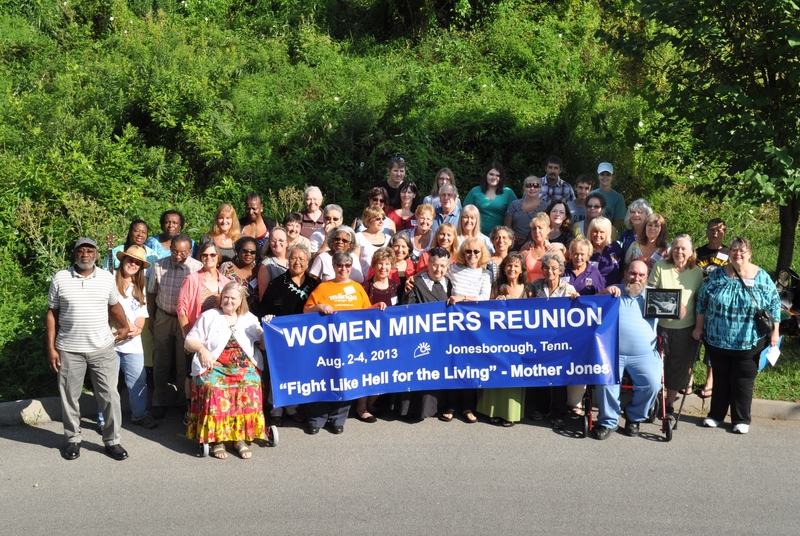 The “Daughters of Mother Jones” originally grew from the women miners’ movement, when two CEP members worked to organize miners’ wives and families in the UMWA Pittston strike in 1988-89. Women staged the first nonviolent act of civil disobedience of the strike, occupying the corporate headquarters, and the CEP members suggested the name, which the women adopted. Now the tradition has expanded to encompass the still-active and amazing group of women coal miners, and next year we have been invited to the Durham Gala to mark the 30-year anniversary of the national strike in England in mid-July. We hope to travel from Durham to your next festival in 2014 and help build the spirit of Mother Jones!